Makes maximum profitability of available space by eliminating aisles between racks. 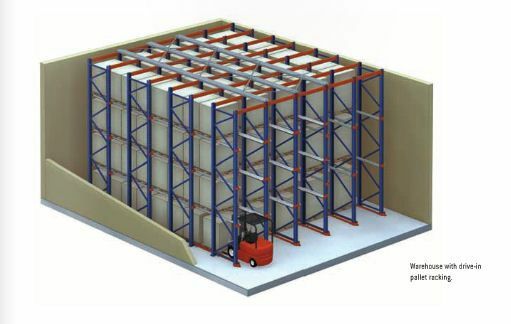 Perfect storage system for homogeneous, low-rotation products with a large number of pallets per reference. This compact, accumulative storage system makes optimum use of available space in terms of both area and height. It is the ideal system for storing large quantities of homogeneous products with fewer product types. Forklifts enter into the storage lanes of drive-in racking to deposit and extract pallets, which means that operating aisles are eliminated, saving a great deal of space.